Genelec personnel with the company's NAMM TEC Award for Outstanding Technical Achievement in the “Studio Monitor Technology” category. 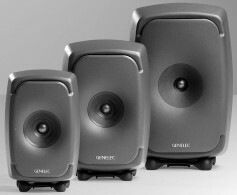 Genelec’s 8331 and 8341 Compact Coaxial Monitors (known as “The Ones” along with the larger 8351) have received a NAMM Technical Excellence & Creativity (TEC) Award for Outstanding Technical Achievement in the “Studio Monitor Technology” category. Presented by the NAMM Foundation, the awards celebrate the best in professional audio and sound production. The 33rd Annual TEC Awards were presented Saturday, January 27, 2018, at The NAMM Show in Anaheim, California. Genelec’s 8341 and 8331 coaxial monitors recently joined the 8351 to create a complete compact coaxial range (“The Ones”) that redefines near-field monitoring. They feature Smart Active Monitoring, the technology based on Genelec Loudspeaker Manager (GLM) 3.0 software for PC and Mac, incorporating AutoCal.